I make the most amazing candy on the planet. It’s called Cherry Mash. A family tradition in our house was to make it for Christmas. However, my daughter and I seem to make it twice a month together now. The problem is it’s made with cherry chips, which I have been unable to find in Arizona, so my mom has to send me bags of it from Nebraska. The other day some friends were over and my daughter said she wanted “pink stuff”, as she calls it. I told our friends she’s referring to the cherry mash we made which was in the freezer. 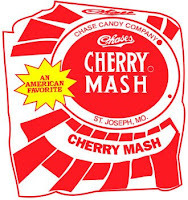 Our friend mentioned there is a huge cherry mash company outside of St. Joe, Missouri, which he had seen advertised, and wondered if my cherry mash was the same thing. While it’s not, I wanted to learn more about this company. Cherry Mash Company was started in 1876 by Dr. George Washington Chase. Dr. Chase was struggling to make enough money to feed his family as a doctor, so he opened a fruit and produce business to supplement his income. His son begged him to open a candy business on the second floor of the market, and they hired a couple candy consultants. Before long, the family shifted their focus to only making candy. By 1918, the Chase family had come up with the concept of Cherry Mash, which is a quarter pound of roasted peanuts and chocolate over a cherry fondant center. During the Depression, candy sales tanked and they struggled to maintain their business. However, in the 1940s, their company became attractive to investors, and Chase candy was purchased by a Chicago firm called Yantis in 1944 for over a million dollars. Today, this candy is their most popular one. It’s mostly found in convenience stores and grocers throughout the Midwest. Melt the above and boil five minutes. Then add ¾ cup cherry chips and 1 tsp vanilla. Spread in buttered 9x13 inch pan. Let set. Melt 1 cup chocolate chips with ½ cup peanut butter. Pour over chip mixture. Chill and cut into 1 inch squares. Ohhh - gotta tell you -that sounds yummy! OK- Yum!I wrote it down. Hey, you didn't mention "my sister" who gave you cherry chips for Christmas, my dear. LOVE THE STUFF.